Citation Information: J Clin Invest. 2018;128(12):5663-5675. https://doi.org/10.1172/JCI96098. Pedigrees of patients and segregation of CNGB3 and CNGA3 disease alleles. Pedigrees are subdivided into 3 groups according to genotypes and correlated disease severity. Group 1: Compound heterozygosity for CNGB3/p.R403Q and a protein truncation mutation in CNGB3 and no mutation in CNGA3. Group 2: Homozygosity for the CNGB3/c.1208G>A;p.R403Q mutation and an additional heterozygous CNGA3 mutation. Group 3: Compound heterozygosity for CNGB3/c.1208G>A;p.R403Q and a protein truncation or splicing mutation in CNGB3 and an additional heterozygous CNGA3 mutation. The genotypes for CNGB3 and CNGA3 of all tested individuals are provided. The presence of 2 mutant CNGB3 alleles with homozygosity for the CNGB3/c.1208G>A;p.R403Q mutation was confirmed by qRT-PCR. 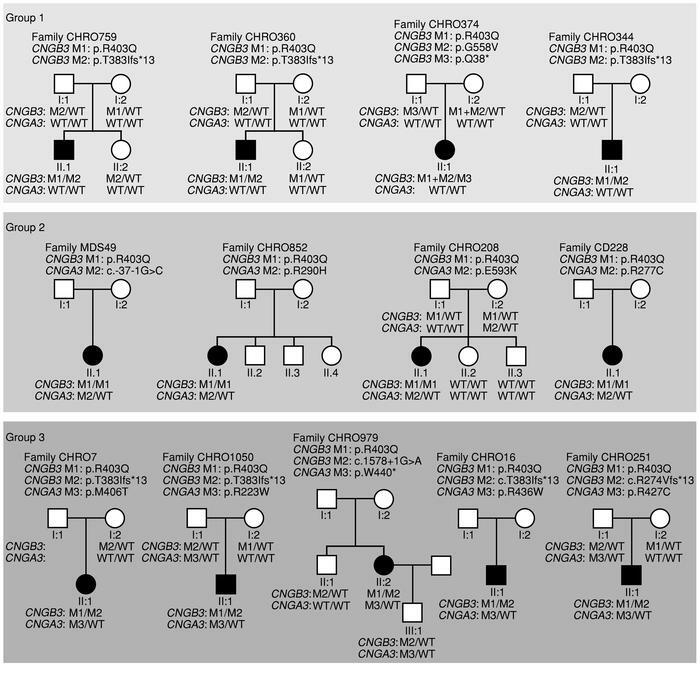 Notably, siblings and parents carrying single heterozygous mutations in both CNGB3 and CNGA3 (CHRO208-I:2; CHRO251-I:1; CHRO979-III:1, and CHRO1050-I:1) are unaffected. The different mutations (M1-M3) in each family are defined above the respective pedigree. M1 was always selected for the p.R403Q mutation.